Last night’s workshop went well. Over 20 energetic, thoughtful and committed students came to share their views and experiences of nonviolent direct action, and to build on their knowledge and skills. 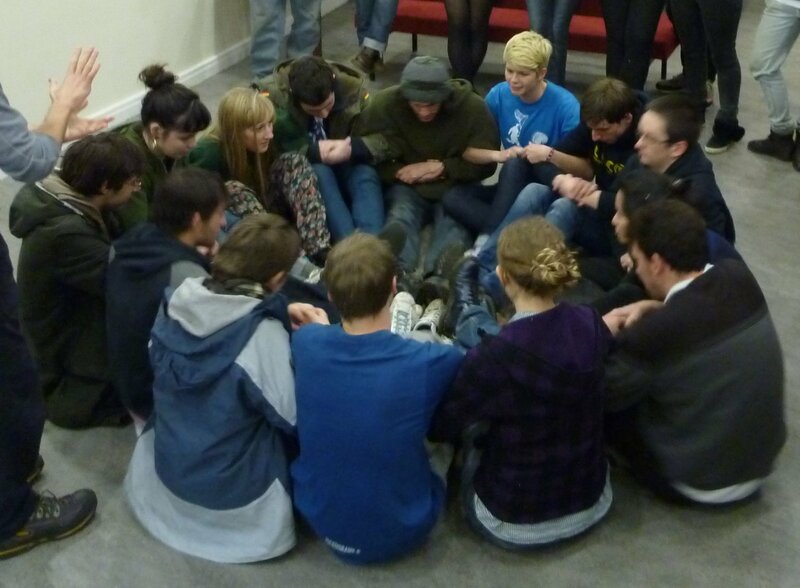 The workshop was moved to the building currently occupied by students as part of their protest against cuts. A fitting venue. We explored what people felt made actions effective, stimulated by images of actions of many kinds from the UK and elsewhere. We debated nonviolence – if an action caused anyone any distress was that violent? Was intention the key to our actions being nonviolent? Many seemed to feel that was the case. For some, some actions like damaging property (cutting through a fence, for example) were inherently violent but could still be acceptable if the wider intention was a noble one. We also looked at some practical aspects of taking action. Using hassle line roleplays we explored interactions with the police which threw up as many questions as they answered. How come many of nonviolent tactics such as linking arms and sitting down left those in the role of police officers feeling more frustrated, even angry and therefore more likely to use force? Was that still nonviolence? We then ‘occupied’ an area of the building and looked at techniques that offered the best support, communication, and feeling of strength in the face of the threat of removal. Finally we spent some time looking at legal rights – what actions could trigger arrest? What might you be arrested for? What might the consequences of that arrest be?